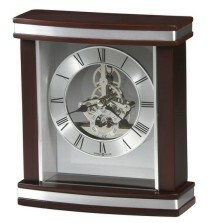 •This contemporary satin Rosewood finished carriage clock with curved front and silver accents features a glass crystal that reveals the intricate, polished silver finished skeleton movement. •The dial includes a circular brushed silver-finished numeral ring with black Roman numerals, spade hands, and separate seconds track with Arabic numerals. •A felt bottom protects your desk or tabletop. Size available: 7½" x 6¾" x 2½"
Laser engravable brass plate(s). Individually gift boxed.